Rotosound aus England stellt neben Saiten für Gitarre und Bass erstklassige Pedale für E-Gitarre her. Alle handgefertigten pedale sind immer bei uns zum Test bereit. Rotosound has reissued its Vintage Fuzz Pedal using the same essential circuit configuration as the original 1960s design, combined with modern resistors and capacitors. The original prototype pedals were only available in limited numbers and were never released for general sales. Nonetheless, these pedals were found all over the place; there's even a picture of Jimmy Page playing one. Rotosound has reinvented this pedal, working together with fabled guitar tone tweaker, Dr. Barry R. Pyatt. The pedal is faithful to the original, with the important active components being genuine vintage germanium stock, thus preserving the authentic, and original, sound. The re-issue circuit, just like the original uses a Darlington Pair for high gain input, which drives a compensated ‘fuzz’ transistor. The Fuzz Control changes the amount of drive from a soft crunch to a gruff growl whilst still retaining the signature germanium roundness. The Treble Control then varies the ratio of bass to treble allowing a good range from muddy to crisp. The Volume Control alters the output level and to maintain cleanliness of sound, the pedal is switched on using dedicated contacts on the ‘instrument’ input jack. The re-issue pedal now features "true bypass" switching to be compatible with contemporary pedal architecture. Renowned as one of the easiest effect pedals to use when first launched in the UK, its simplicity was always one of its main attractions as well the exceptional tone and smooth sustain. The new pedal retains all these original qualities with the addition of contemporary controllability and consistency. The pedal is encased in a pressed steel box finished in a gloss silver hammer powder coating, again mimicking the traditional Rotosound pedal. It is extremely robust, durable and hardwearing and in keeping with their tradition of manufacturing in the UK, the pedal is made at Rotosound’s factory in Sevenoaks, Kent, under the strictest quality control. 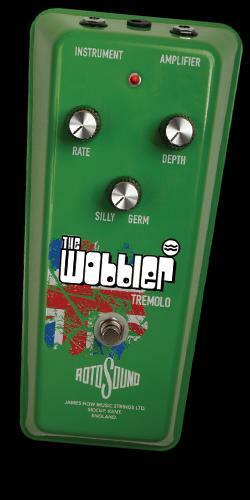 The Wobbler tremolo pedal has a smooth range control of rate and depth, vintage optical attenuator and unique control of its silicon and germanium signal paths. This provides a variety of sounds that captures a vintage valve amp tremolo tone. 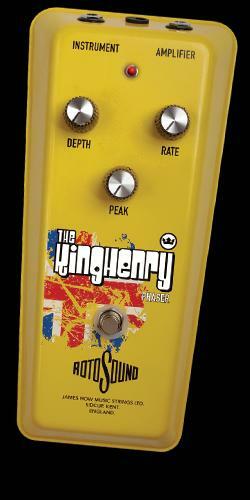 Making it easier to sweep through the entire audio range from shimmery to vibrant, twisting to resonant guitar is the new King Henry phaser pedal. This comes with PEAK, a control for the wider ranging of phase effects. Perfect for tone shaping is the Leveller, EQ pedal. With its silicon and germanium signal parts it provides constant bandwidths on either side of frequencies. With a choice of Boom, Fuzz and Honk options, there’s a wide range of tonal options available. The hybrid Aftermath with its warm analogue delay and precision digital circuitry gives superb modern control and fine-tuning capabilities helping to emulate a retro delay tone. The Pusher compressor pedal. Its audio dynamics controller provides noise reduction helping to get a more transparent tone and help increase sustain. It aids the preservation of that essential essence of the string being plucked. Allowing chorus effect to be mixed from minimum to maximum with LEVEL control is the Crusader chorus pedal. This makes guitars sings with sparkly, lush sounds that have a rich smooth quality.